The components of the StratusLab distribution are quite modular and allow for a variety of different deployment layouts. This chapter provides some advice when considering the deployment of StratusLab in your data center. The chapter concludes with a description of the minimal deployment of StratusLab on two machines. This deployment serves as a good testbed for understanding the installation process and how the cloud services work. When considering your deployment, you must consider who are your intended users. The level of trust you have in those users will impact further decisions on the network configuration, service layout, and authentication methods. For clouds at the “Infrastructure as a Service” level, like StratusLab, there are generally three types of cloud deployments: private, community, and public. Private cloud deployments target a limited set of known and trusted users. An example is using a cloud deployment to provide a flexible infrastructure for an institute’s services. These types of clouds are often run by and used by the same system administrators. Because of the high-level of trust in the users, less needs to be done to isolate cloud services from the cloud’s virtual machines. On the other end of the spectrum are public cloud infrastructures. These target external and possibly unknown users outside of the institute’s administrative domain. These generally require a higher level of isolation of service and more fine-grained network segmentation. Between the two are “community” clouds. These function like public clouds but have a more limited set of users. A cloud infrastructure destined for scientists at a number of collaborating institutes is a good example of a community cloud infrastructure. StratusLab puts very few constraints on the network configuration supporting the cloud infrastructure. At its simplest, it can work on a single network tying together all cloud services and resources. It can also be made to work on complicated network configurations with multiple VLANs, protocols, etc. DNS configured with reverse-DNS lookups for those addresses. The range of addresses must be IPv4 addresses, but each address can also have an IPv6 address associated with it. Traffic between nodes hosting virtual machines and physical resources (e.g. storage). The level of isolation between these different types of traffic depends on your type of cloud deployment and your desire for a secure infrastructure. For a private cloud infrastructure, mixing these three types of traffic on the same network doesn’t pose any particular problem and is the easiest to configure. However, for a public cloud infrastructure it is a good idea to separate the three types of traffic on separate VLANs. Even better, physical segregation of the virtual machine traffic from the other traffic prevents any possible compromise of the cloud services from the running virtual machines. This is obviously more complicated to configure. You must weight the additional complexity against the potential threats from your users. There are three classes of services that need to be mapped to physical machines: Couchbase instances, CIMI interfaces, and resource controllers. The usual mapping for Couchbase instances and CIMI interfaces is to deploy these on the same physical machine. For scalability and redundancy, two or more such physical machines are deployed. 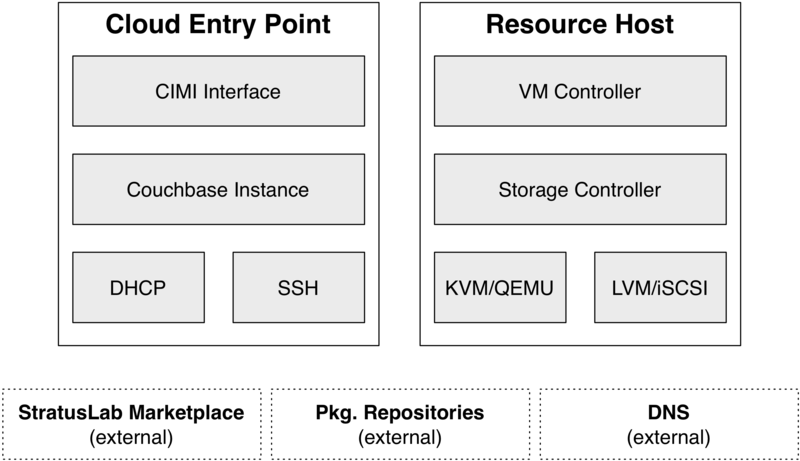 Resource controllers are generally deployed on the same physical nodes that provide the underlying resources. For example, the VM controller is deployed directly on the machine(s) running the hypervisors. This arrangement minimizes the number of physical machines that need to be deployed. You can alter the mapping as necessary to adapt the needs of your data center. For example, you may have resources (like a storage appliance) that require having the controller hosted on a different machine than the resource it is controlling. The examples in this guide use a minimal deployment of two physical machines. One machine (the “cloud entry point”) contains the Couchbase database and the CIMI interface. The other contains all of the resources controllers and resources used for the cloud. A single network for all traffic types is assumed for simplicity in this minimal deployment. The following diagram summarizes this deployment.